Say hello to your new best friend for birthday parties, special occasions, or anytime you need a chocolate fix. There is no denying that special occasions call for a slice of chocolate cake (or cupcakes!) but when you need an allergy friendly recipe, things can easily get complicated -or worse, not turn out the way you hoped. Of course, nobody bakes a cake the day of the party, so I’m sure you are wondering, can this allergy-friendly cake be frozen? The short answer is yes! You can bake the layers and freeze them, take the cake out of the freezer the day of the party, make the allergy-friendly frosting, and assemble it. Want to save more time? Make the entire cake and freeze it, whole, and take it out the night of the party. If you have room in your freezer, then why not? Thawing out this cake does not affect its delicious texture and flavor, and you’ll save yourself a lot of time. I know that making an allergy-friendly cake from scratch can seem overwhelming -where do you even find the ingredients? Well, for starters, you are probably using most of them already so know that they are often easy to swap for another brand. This recipe is not brand specific. 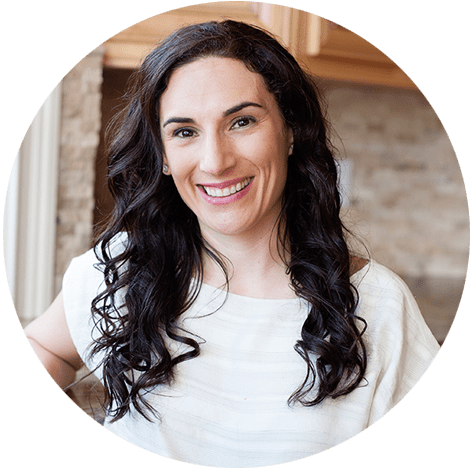 For most people with severe food allergies, using a mix out of the box isn’t an option, so this version allows you to select your favorite gluten-free flour. 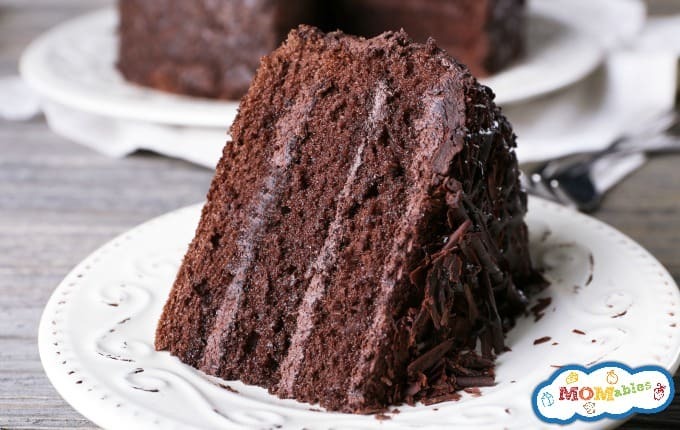 You’ll also find that the use of chocolate non-dairy milk gives this cake a moist, rich texture that will bring everyone back for seconds. You can find this dairy-free option in the refrigerated section of your grocery. Did you know that you can find allergy-friendly recipes for dinner and lunch on our website? Yes! Weekly grain-free or dairy-free family meal plans are available if meal planning is a challenge. With completed shopping lists and prep-ahead tips, it’s a great option to help you save time! Hold on, did I mention the frosting? We can’t forget about a homemade allergy friendly frosting for this cake! Let’s just say it takes the cake… to the next level. I recommend using vegetable shortening, to keep the frosting thick and easily spreadable. You might need to double the batch since half of it seems to disappear before I can even get the cake cooled for frosting. The batter will be quite runny but not liquid. It should still have a bit of volume to it. Make sure to butter, grease, or line your cake pan with parchment paper so that you can lift it out after baking; it tends to stick a bit. I hope you enjoy your allergy-friendly celebration! Preheat the oven to 350F. Coat two 9-inch cake pans with cooking spray and set aside. In a large bowl, combine the flour, sugar, cocoa powder, baking soda, xanthan gum, and salt, and blend. In a medium bowl, combine the milk, oil, vinegar, and vanilla. Pour the wet ingredients into the dry ingredients. Stir until smooth, scraping the bottom and sides of the bowl. Pour into greased cake pans and place in the preheated oven. In a large bowl with an electric mixer beat the vegetable shortening until light and fluffy. Add the vanilla, cocoa powder, and powdered sugar. While mixing on medium speed, add the coconut milk or creamer slowly until all ingredients are combined and the frosting is smooth. If the frosting is too thick, add more creamer 1 tablespoon at a time. If it’s too runny, add more powdered sugar 1 tablespoon at a time. Frost the cakes after they are completely cooled. Dear Momables, what should be the consistency of this cake? Pouring or thick? There are 5 questions above on the same matter that have not been answered, please inform us :) Thank you! The batter is quite runny. Could you use almond flour in place of the gluten-free all-purpose flour? You can’t use almond flour in place of an all-purpose gf flour. Almond flour isn’t a “flour” at all it’s just ground almonds. The recipe won’t turn out. Can I use xylitol in place of the granulated and powder sugar? Barabara, I’ve never used it so I can’t advise on the quantities. I imagine that it would be significantly less. Do you need to use x-gum or could you leave it out? That’s the only thing I don’t have. I’m so happy though! Thank you! You must use X-gum or your flours won’t bind. It’s essential for gf baking. If my gluten-free flour mix already has xantham gum, do I need to add more? No. if your mix has it omit. My batter was also very thick, definitely not pourable. What type of non-dairy chocolate milk was used? I used SO Delicious coconut. Just wondering if the 350 is F or C. I am in Aust. My oven only goes to 250C. our temperatures are in F. You’ll want to set your oven to 175C. If I use all purpose flour, can I omit the xantham gum? I don’t need it to be gluten free and I don’t have any xantham gum. I have not tired this recipe with all purpose flour. it was specifically created for gluten free mixes. You’ll need less flour and yes, you can omit the xg. How much less all-purpose flour? do you think. I also don’t need to be gluten free. Just dairy, nut, egg and soy. I’m not really good at experimenting with recipes. Thanks. Mark, this recipe was not developed for regular flour and therefore I cannot advise specifically on how much less. If you are not an experimenter, I highly suggest looking for a recipe that is egg free only. dairy can easily be substituted in any recipe for an alternative replacement. Can I use maple syrup or honey in place of the sugar or any other natural sugar replacement? a liquide sweetener will change the consistency of the batter. can you use coconut palm sugar? The top layer of the cake seemed to be dried up when I tried. Can you please tell me what could have been the problem. Otherwise everything else was fine. I’ve never baked a cake before but having a child with dietary restrictions is compelling me to acquire new skills which is great! I tried making this cake in preparation for my son’s 4th birthday this weekend and he is gluten, dairy, nuts, eggs and seafood intolerant. I followed the recipe to a “T” and it turned out fabulously (at least that’s what my office mates said)! The only thing I added is some gluten/nut/egg/dairy free dark chocolate chunks. This cake is fantastic. I brought my “test” cake to work and nobody knew it was allergen-free. My only question is, I plan to make a rectangular cake for my son’s birthday. Will a 9×13 rectangular cake pan work with this recipe? Again, thank you so much for sharing this. It will really make my son’s birthday all the more memorable. a 9×13 pan will work. just keep an eye on the baking as time will vary (a few more minutes I think). Glad everyone enjoyed it! I just wanted to let your readers know that “non-dairy” creamers still have casein in them, which is milk protein. To be truly gfcf, you would have to substitute that with the coconut milk. did you use the same amount of coconut milk in replace of the creamer? When making cupcakes using this recipe, how long should I cook them for? And still at 350? for cupcakes I would say 18-22 minutes but check around minute 16. Thanks so much for this recipe! Just deleted dairy, gluten and soy temporarily from my sons diet and his birthday is this week. I was dreading not having a cake to make for him but now I think I can. I do not use vegetable oil anymore and I read a the posts but I’m not sure if there was a definite answer. In lieu of the vegetable oil can I use coconut oil? Also, for the frosting, can I use coconut oil in lieu of the non dairy spread? I’m not a fan of it… Thanks again for all you do! I wanted to make this for my son’s 1st bday- any suggestions for making it sugar free? Would maple syrup work you think? Patricia, all flour blends are different so it is a bit difficult to pin point your issue. Altitude will affect rise height for sure. I don’t think you did anything specifically wrong, it’s just the combination of flour used and altitude. Really excited about finding this recipe. I want to bake my three year old her first real cake. i live in the UK and am worried about taste and measurements having read previous post. Do you have this recipe in metric? I do not have this recipe converted to metric yet. It’s on our to-do list. You can use coconut milk (the thick canned stuff) instead of “non dairy creamer”. thanks! same quantity of coconut milk as non dairy creamer? I’ll try this on Fri and let you know how i get on, can’t wait! Hi, I tried making this cake a few days ago, I used olive oil instead of vegetable oil and it tasted horrible, I assumed it was because of the olive oil so yesterday I went and bought some vegetable oil and a new pack of bicarbonate of soda (I live in the UK and the internet tells me this is the same thing as baking soda?) and tried again. I baked the cake for 25 mins, it wasn’t fully cooked so put it back in for 5 mins, still wasn’t cooked so did it for another 5 mins, and then still wasn’t cooked (the middle was sagging and the bottom still squishy) so put it in for another 5. When I took it out and it was finally cooked it tasted vile. I followed the quantities and recipe to the T – can you please let me know what I’m doing wrong? Is there anything in there that would react badly to too much heat? Or are you supposed to eat the cake whilst it is still partly uncooked? Any advice would be much appreciated – I was so excited to find this recipe and I’m so disappointed! Becky, I think the error might be in your metric conversions. I’m sorry this didn’t turn out well for you, it’s a huge success for us and thousands who have visited this recipe. This recipe allows for NO SUBSTITUTIONS. I don’t know if heat is the issue… since I’m not there making it with you. Please revise your conversions. Thanks for your reply – I used measuring cups for the measurements, I’m assuming a cup in the UK is the same as a cup in the US? Do you know if bicarbonate of soda is the same as baking soda? Actually, a UK cup is bigger than a US cup, so that might be your problem. Bicarbonate of soda and baking soda are the same thing. I made this cake last night. I measured baking soda exactly , but today the cake has a strong soda taste! Can the soda be reduced a little ? did you modify any of the ingredients? this cake does not have a strong soda taste. sorry it did not come out! I would so much like to try this as yet not really had success in getting a cake or baking her a cake which she has liked. She is dairy,wheat,egg,nut free and so I am hoping this recipe could fit the bill! I will give it a go to or may try the cupcakes first. Let us know how she likes them Sangeeta! I made this cake with coconut milk and the batter was like playdough. It’s still cooking so I’m not sure, but I literally had to push it around to get it to fill in the cake pans. Is this normal? My batter had the same consistently. Did yours turn out? Awesome cake. I followed the recipe to the T. But, I thought the frosting was too sweet. I would do maybe 1.5 cups of powdered sugar. Amazing! Amazing! I made this cake for my birthday. It has been the first “real” tasting cake I have had in the eight months since changing my diet. Did I mention how amazing it is? Thank you. I am so glad you were able to celebrate your birthday Grace! Can you substitue the sugar for Stivea? in this case no. you are going to have to make up for the volume difference. Hi there! I am super excited to try this cake! My husband’s birthday is on Tuesday and I only have time to bake the cake today. Do you think it will taste okay if I bake it today and we eat it on Tuesday evening for his birthday? What’s the best way to keep the cake fresh? the best way is to keep it in the fridge and make sure it’s frosted. What a great cake! I used coconut milk instead of the non-dairy milk and creamer. I increased the cocoa in the cake to 1/2 cup to make up for the bit of chocolate that wasn’t in the cocnut milk. I made them as cupcakes and got 22. Baked for 20 min. I haven’t read all the comments but noticed at the top that someone was asking about xantham gum. I have used guar gum very successfully instead of the xantham gum. Guar gum is much cheaper (at least where I live). I want to make this but the only cake pan I have is a bundt. Will that work or do I need to go buy new pans? sarah, i dont’ think this will work with a bundt cake. time will need to be adjusted. temperature and cooking time was developed for round cake pans. at your grocery store next to the baking items by the yeast. Or online on sites like Amazon. Check out the pantry section of our store. In other recipe (marshmallow fluff) you mentioned that xantham gum is fake stuff you didnt want in your fluff and here you are using it for this cake? why? thank you for bringing that to my attention. Different contributors write up the posts so the opinions can vary. I will check on the other recipe. that said, xantham gum is not a natural food. it is fermented bacteria from a grain or legume (wheat, corn, soy) into a polysaccharide -although a much cheaper alternative is done from the whey biproduct during cheese production. The xanthan gum polysaccharide is then precipitated from the solution using isopropyl alcohol, dried, and milled into a powder so that it can be added to food and other products. Therefore, Xantham gum is actually a highly processed ingredient. 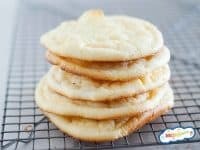 It is used in minimal doses when baking with gluten free flours (such as in this recipe) but in a batch of fluff I would need about 2 teaspoons -a dose I’m not comfortable using in one recipe. Great recipes! When gf baking, I was taught that xanthum gum is best for breads and guar gum is best for cakes. Guar gum is from the guar bean. I’m wondering if I can use applesauce instead of xanthum gum. I’m abroad and don’t have access to xanthum gum so please let me know how much applesauce to use and if I should use baking powder and take out the vinegar & baking soda. Thanks! this recipe has been successful as is. you need xantan gum to make the gluten free flours stretch. I would not make any substitutions. This recipe works as is. Hi, I am looking at making my mom some GF mixes for Christmas to help her in her new journey to be GF. I was looking at this recipe because with the vinegar it’s a lot like “whacky cake” that my great grandmother used to make and it’s my mom;s favorite cake. I was wondering if I could mix all the dry ingredients together and place in an air tight container (mason jar) for her to make when she is ready? Also, is the Xantham powder a must? I don’t know what it is or what it does. I am obviously new to this. Thanks in advance! eve, you can absolutely use regular dairy items for this recipe. I wanted to make this cake, but am not sure where I can find the xantham gum. I don’t see it at the Safeway that I shop at usually. Where can I get it? safeway might have it by the gluten free mixes/flours. Trader joes, whole foods… or online at Amazon. great to know that it worked well with BRM! my grocery carries it and I find it to give mixed results. thanks for giving your feedback! My daughter is dairy free, soy free, gluten free, egg free, and CORN free. I used 3 cups of rice in the blendtec for the GF flour, SO Delicious brand coconut chocolate milk, and coconut oil. Since we can’t have corn, we can’t have powdered sugar. But my blendtec powdered raw turbinado and I added about 1 tablespoon of potato starch for each cup of sugar. I used SO delicious coconut creamer, and coconut butter for the frosting. This is rich and decadent, and now my daughter can have cake! I’ll try scaling back on the turbinado in future occasions. We don’t sweeten our foods, and this recipe was so very sweet and fudgey. I think our family could manage half the amount of sugar. Extended family? Had no idea! I will add for readers that the texture for me was very dense and fudgey, similar to brownies or flourless cakes. This cake is undoubtedly no Duncan Hines fluffy boxed cake. But so much better! I’m so glad you loved this cake Jeni! I will like to follow this recipe for 6 cupcakes, is this possible or am I to look out for a different recipe. I am making this for my daughter and some other kids in school with allergies for a cupcake sale day. Toyin, the recipe will yield 24 cupcakes. The cupcakes taste really good so even kids without food allergies will like them. If you wish to halve the recipe, it’s up to you. I have not tried making in a smaller batch. Thanks, I halved the recipe and got 14 cupcakes but it didn’t turn out nice. Today, I went for a Quarter with a little more liquid and stirring for a little longer to ensure the mixture was very smooth and it turned out really nice. how can I adapt it to make a different type of cupcake? Toyin, this recipe is not an “adaptable” recipe to make yellow cupcakes, etc. it was specifically developed to be a chocolate birthday cake/cupcakes. So glad they were great for the birthday celebration! Hi I was just wondering I wanna make this cake. Alisha, I don’t see why you should have any issues getting these ingredients in Au. happy baking! This cake mix is quite sticky and thick. Is it meant to be. Hi Alisha, it really needs to baked in two tins. It will not cook/rise properly all in one. Thanks! Why does the center of each of my cakes sink? chocolate rice milk, and my cake sunk in the middle and I never could get it done. i read several reviews and found no one else with this problem I didnt alter the recipe in any way. Any ideas about what I may have done wrong? I see two issues with the middle not cooking through. 1. did you use the right pan size and 2. your oven might run too cold. My daughter and I are currently gluten and dairy free. It’s her 2nd birthday at the end of the month and I’d like to try this recipe. I live in Scotland and don’t have access to the King Arthur flour. Do you know anything about Doves flour? Is it any good? Also, for the coconut milk, do you mean coconut milk in a can, that is quite thick, for cooking curries, or the stuff that is mixed with sugar, etc as a milk substitute drink? I’d like to know this for both the cake and the frosting please! I’m not much of a baker – I hope I can do this cake justice! What did you use for the filling between layers? It looks darker than the frosting? Rachel, same as the frosting. Might be the lighting on the photo. This sounds perfect for my son’s 2nd birthday coming up. But I am wondering if I can use regular chocolate milk? He is gluten and egg free but not dairy free. Thanks. Hi! I want to make this cake but I also want to use agave nectar instead of sugar, do you think this will work or have you tried it before? Thanks! Saffy, I’ve tried it with honey and it didn’t work well. If you don’t want to use regular sugar I suggest coconut sugar. I’m glad to find ur website. Made this cake (half recipe In a round pan) today, came out really moist and tasty.I did some adjustments :instead of Choco milk, reg sugar , apple cider vinegar I’ve used plain soy milk , organic cane sugar, rice vinegar and my flour blend is:1/2 c brown rice flour 1/2 c white rice flour 1/2 c potato starch,1/4 c tapioca starch/flour.thank you . So glad you were able to make an allergy friendly cake! Thank you for sharing that it was a success. You said coconut milk would be a good replacement for the creamer. What about the non-dairy chocolate milk? You could use non dairy almond milk or soy milk. Can i use rice milk instead? Thanks. I am wanting to make a gluten free, dairy free, cane sugar free chocolate cake please advise. Cindi, if you omit the sugar your cake might not taste good at all. the recipe is already dairy and gluten free. I’m new at this new way of life. My son is intolerant/allergic to gluten, dairy, egg and chicken. He will be turning one year in November so I’m trying all the chocolate cake recipes I find. I fell in love with picture of this cake and I tried so enthusiastically to make it but it turned out horribly! Dulce, Baking soda. Bad baking soda (over exposed to air) will ruin this recipe. Also the type of GF flour used. All GF flours are Not all created equal. Check out the ones we recommend in the pantry section here. So The substitution for coconut oil is ok? So that when I make it again I can consider using it again…… How should I store my baking soda to prevent it from going “bad”? In the United States, most baking sodas have expiration dates (best by dates). Once opened, about 3 months. Baking soda needs an acid to get a reaction, so use the same method as for baking powder but add 1/4 teaspoon of vinegar to the water before water before adding the soda. As before, if it bubbles up, your soda is fine to use. If you don’t see bubbles, then sadly, you’ll need to take a trip to the store and buy a fresh box! If there isn’t much fizzing, your ingredients are likely on their way out. You can probably still use them to get some lift, but your baked goods will be more dense that usual. Don’t be tempted to double the amount of baking soda or powder – that would make your food taste seriously strange! Just wondering if I can use the palm coconut sugar in this recipe. What GF AP flour do you use? I currently have one that’s a mixture of brown rice, white rice flours with potato and corn starch. Do you make your own GF AP flour or do you buy it pre-made? My go to GF all purpose flour is king arthur’s gf all purpose flour mix. It’s cheaper when you buy the 3-pack. Do you use liquid creamer or powdered? Do you think I could directly substitute regular all-purpose flour for the gf flour? I am not trying to avoid gluten, just dairy. This is not a recipe designed for standard flour. For optimal results, use a traditional chocolate cake recipe. Here is my go-to recipe. Oh Momables…so glad to discover you. I’m not good at converting recipes, just making them! I’m thrilled to be trying your Morning Glory Muffins and then chocolate cake this week. Keep them coming. thank you Donna! Glad you found us too! Please be aware that If making this recipe for someone with a milk allergy that “non-dairy” products, particularly creamer, actually can contain milk protein. What would you suggest using in place of the non dairy creamer? I have a son with a dairy allergy and I am nursing a baby who we also think may have a dairy, egg allergy and another son we are limiting his gluten. Tammy, I would suggest coconut milk.